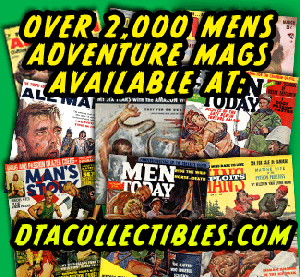 In addition to featuring great pulp art by many talented illustration artists, men’s adventure magazines published in the 1950s, the 1960s and 1970s featured stories by many notable writers. One of my personal favorites is author Robert F. Dorr. 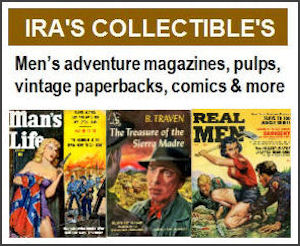 From the late 1950s to the mid-1970s, Bob Dorr wrote hundreds of stories for top men’s adventure magazines, such as STAG, MALE, MAN’S MAGAZINE, MAN’S WORLD, MEN, FOR MEN ONLY and BLUEBOOK. He went on to become one of America’s top military historians. Over the past few decades, Dorr has written more than 70 non-fiction books and he’s still going strong. His latest book is MISSION TO BERLIN: The American Airmen Who Struck the Heart of Hitler’s Reich. It provides a fascinating look at World War II bomber pilots and crews and the huge American bombing mission over Berlin on February 3, 1945 — the largest bombing mission undertaken against a single target. 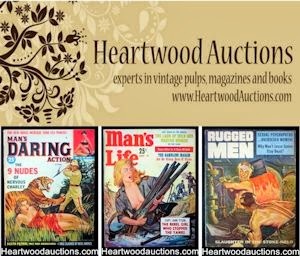 Men’s adventure magazines were heavily targeted to military veterans and Dorr has always been interested in military history. So it’s not surprising that many of the stories he wrote for those magazines are war stories. 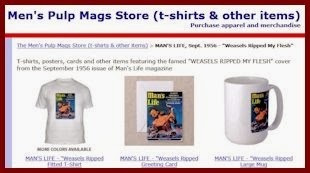 However, he also wrote many other kinds of stories for the men’s pulp mags, ranging from adventure and spy stories to exposés and killer creature stories. My recent nighttime reading included Bob Dorr’s new book MISSION TO BERLIN and two of his stories in magazines from my collection. One of those stories — “BAYONET KILLER OF HEARTBREAK RIDGE” — is an interesting early example of his military history writing. It’s about U.S. Army Sergeant Donn F. Porter, a real-life hero and Medal of Honor recipient who was killed during the Korean War. 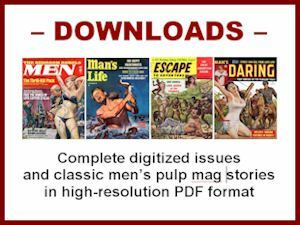 The other Bob Dorr story I read recently is a classic example of the pulp fiction adventure yarns he once wrote for men’s adventure magazines. It’s one of two stories featured on the cover of the March 1971 issue of FOR MEN ONLY. On the cover, it’s called “I SURVIVED PERU'S SCORPION CULTISTS” and illustrated with a wild “scorpion torture” painting by artist Earl Norem. On the inside, it’s titled “I WAS SEIZED BY PERU’S ‘SCORPION CULT’ TRIBE” and illustrated by the editors with a set of laughably unrelated stock photos of “natives” from several different continents, along with a pic of some guy in a cowboy hat. He’s supposed to be the “Yank adventurer” who told Bob Dorr this purportedly “true” — but obviously fictional — story. It’s interesting to compare Bob’s writing back then with his writing today. I see several common features all of his work, from his early men’s adventure stories to his most recent history books. He has a knack for describing locations and action in ways that impart a strong sense of place and make you feel like you’re there. He’s also good at making characters come to life — whether they’re real or fictional. Bob’s detailed accounts of the experiences of various bomber crews in MISSION TO BERLIN are eye-opening and awe inspiring. They give you a real appreciation of how tough and scary it was to be a crew member on B-17 “Flying Fortress” or a B-24 “Liberator” bomber. And, those were just some of the basic dangers bomber crews faced even without being hit by enemy fire. Bob’s accounts of what crews faced when their bombers did get hit are jaw-dropping. One of many examples is the story he tells about what happened when flak tore through the B-24 named Missouri Belle. Pilot Bob Vance “discovered that his right foot was essentially severed, attached to his leg only by tendons, and was jammed inextricably behind the seat of the wounded copilot.” Despite his injuries, Vance kept the Missouri Belle aloft long enough for his crew to bail out. He then ditched the plane in the English Channel. Amazingly, Vance survived and was picked up by British rescue boat. As he was pulled aboard, he said sardonically, “Don’t forget to bring my foot in.” It was still attached by a few tendons. I recently posted an in-depth review of MISSION TO BERLIN on Amazon.com. The bottom line is this: if you’re interested in World War II or military aviation history, or if you just enjoy reading good history books, you should read Robert F. Dorr’s book MISSION TO BERLIN. It’s a helluva ride. Just like Bob’s vintage men’s adventure stories.